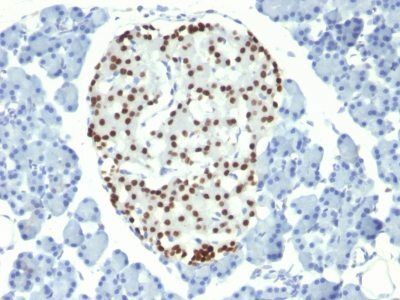 Expression of NKX2.2 has been found in neuroendocrine tumors of the gut, making it a potential marker for the study of gastrointestinal neuroendocrine tumors. 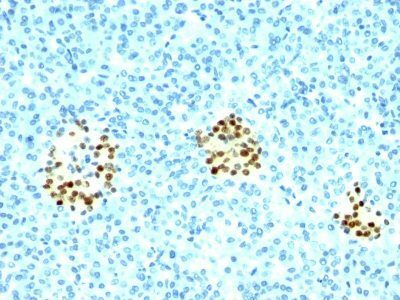 Expression of NKX2.2 has been found in neuroendocrine tumors of the gut, making it a potential marker for the study of gastrointestinal neuroendocrine tumors. More recently, NKX2.2 protein was identified as a target of EWS-FLI-1, the fusion protein specific to Ewing sarcoma, and was shown to be differentially upregulated in Ewing sarcoma on the basis of array-based gene expression analysis. 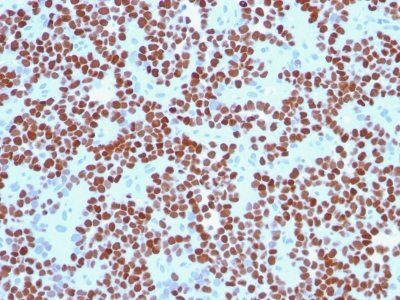 It acts as a valuable marker for Ewing sarcoma, with a sensitivity of 93% and a specificity of 89%, and aids in the differential diagnosis of small round cell tumors. Catalog number key for antibody number 0294, Anti-NKX2.2 (NX2/294) The prefix indicates conjugation, followed by the antibody number and size suffix.